Contrary to popular belief, emission standards are strictly enforced within the United States. This is precisely why it is imperative to keep your automobile’s emissions up to standards for when you renew your smog tags. If you fail to do this, you could be fined a substantial amount of money. 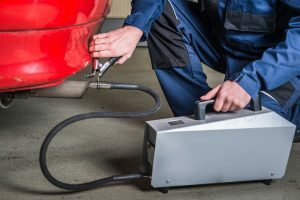 If you are located in the Clinton area, it is wise to reach out to Expert Auto and Tire for high quality emission service in Clinton. By working with Expert Auto and Tire, you can be sure that you are in good hands. At Expert Auto and Tire, we realize that car maintenance can be expensive in order to meet the demands of the DMV standards. This is precisely why all of our technicians are trained in detail on emission requirements so that no vehicle leaves our shop without the proper tests. By providing this guarantee to our customers, we find that we have many returning customers and new customers on a regular basis. If you would like to come in for an emission service, it is usually best to schedule your appointment in advance with one of our customer service specialists. Furthermore, when you do, be sure to ask about our current promotional offerings that could be beneficial to you. In order to schedule an appointment or to learn more about Expert Auto and Tire for your next emission service in Clinton, please contact us today by dialing (888)292-8784. This way, our technicians will be able to check your automobile thoroughly in order to ensure that your vehicle meets all emission standards for an affordable price. Thus, do not hesitate to reach out to us today. We would be elated to assist you in your upcoming automobile service.